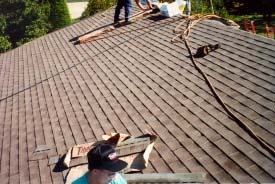 This 26 square, tear-off, intersecting roof job was started at 7:00 a.m. By 2:00 p.m. that same afternoon, caps were being installed on the ridge vent, completing the roofing installation. 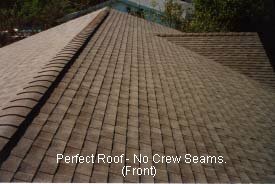 DCI’s RevealTape configured the entire roof, both horizontally and vertically, facilitating multiple installation crews. 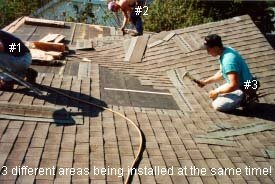 After the first course of shingles has been installed, using the RevealTape, simply place the first line of RevealTape at the top of the installed shingle. Nail or staple the RevealTape to the roof as far up the roof as you can go. Do the same procedure on the other side of the roof. Snap line between the two RevealTape strips, or just use tape marks. 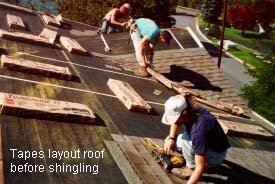 Align top of shingles along the tape line created using RevealTape. Install RevealTape along each side of the obstruction. You can even strike lines using the new revolutionary RevealTape without using your pencil & measuring rule.